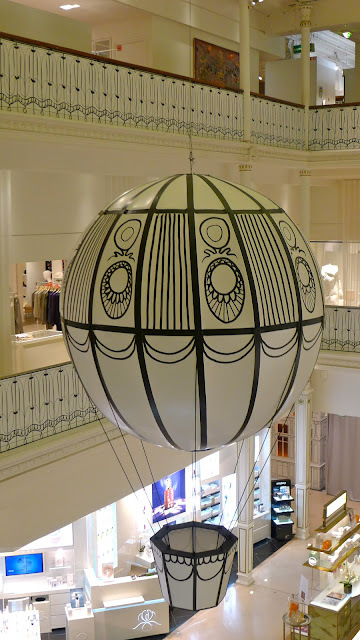 Currently celebrating its 160th birthday, the world's first important department store, Bon Marche, remains attractive and appealing in its wonderful building which just happens to have been designed by Monsieur Gustav Eiffel. Yes, he of that certain iconic metal structure fame ! ... and the whimsical and creative window displays with their 3D pop up book effect. Bon Marche has chosen the fabulous French actress, Catherine Deneuve, to be the face of their celebrations. She has lived in the St Germain area for years and recently commented that the Left Bank symbolises relaxation, freedom and fantasy. You are able to go from Cafe de Flore to the Pantheon Cinema and buy a book on the way. She also said she likes to buy her Christmas ornaments at Bon Marche each year. Bon Marche is more intimate than the two better known department stores on the Right Bank and is worth a browse at the very least. Don't forget to also visit its amazing food hall, la Grande Epicerie, just a few doors down rue de Sevres in the 7th arrondissement. and the range is huge. It also has this stunning glass domed ceiling which is definitely worth a look. Printemps is elegant and does give discounts and has the best beauty hall of them all. Although different firms in England, and even my own country, Australia, claim to have had the first ever department store, Bon Marche is certainly the first for France and Europe, as you say and still a leader in so many ways. Paris and all the department stores I will never tire of! Thanks for commenting - I also love all those individual little stores that display such creativity and originality, don't you? Thanks for stopping by PB and for the heads hp on the Bon Marche celebration! I'll be arriving the 27th and will rush over to enjoy the last day. You would enjoy Zola's novel Au Bonheur des Dames about Paris' department stores.